Pinterest is a great place for inspiration and I saw this quilt and quickly pinned it, knowing I would be back to make it. The pattern is found in Fons and Porter's Easy Quilts, Spring 2014 edition. Last week, I checked the magazines when I bought my groceries and bought the magazine. I think I could have figured it out on my own, but it's always nice to have a new magazine or two to browse through! I traced the circle template onto some template plastic that I've had for a very long time and dug my stack of old jeans out of the back of the closet. I found a video to play in the background while I traced and cut and in a few hours, I had 168 circles cut from my stack of blue jeans. 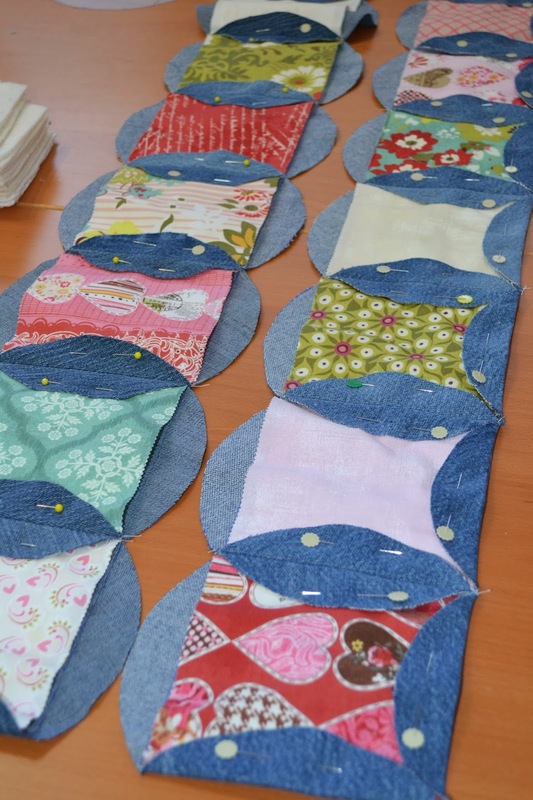 The thing that caught my eye about this particular jean quilt was the bright colored fabrics that were peeking out from between the blue jean circles. I have a lot of fat quarters and fabric scraps, but I also had 4 packs of charm squares from Moda's Basic Grey collections - two from "Kissing Booth" and two from "Hello Luscious". A great way to save time as cutting 168 squares takes a lot of time! I did go into my batting scraps to finish prepping for this quilt. I save bits and pieces of batting as small as 3" and found enough batting to cut 168 squares, each 4.5". The pieces are not all the same, some are 100% cotton, some are cotton/poly blend, some are white, some are a natural color. Because of the way this quilt goes together, I don't think it will be noticeable in the final quilt. So now that I have all the pieces prepped, it's just a matter of sewing it all together! Doesn't it look like a lot of fun? I love quilts made in small sandwiches. They don't seem so daunting! Beautiful......This is just what I was looking for to bust my jean stash!!! If you cut your batting at 4.5 inches.... Is that the same size, that you cut your colored fabric squares also... if not, what size were they... 5 inch ? Is your diameter of your blue jean circle the same as the squares... what is the diameter of the circle? Thanks so much for giving me a new design and idea to work with for my next project!